Farmscaping is a whole-farm, ecological approach to increase and manage biodiversity with the goal of increasing the presence of beneficial organisms. Many pest populations can be managed by enhancing the efficacy and local abundance of the existing community of natural enemies through modification of the environment, a concept that has been termed "conservation biological control." Farmscaping methods include the use of insectary plants, hedgerows, cover crops, and water reservoirs to attract and support populations of beneficial organisms such as insects, spiders, amphibians, reptiles, bats, and birds that parasitize or prey upon insect pests. Insectary plants like mustards interplanted with market crops provide pollen and nectar to attract and maintain beneficial insects in the crop landscape. Farmscaping aims to prevent damaging levels of pests from developing in the crop ecosystem. Early research demonstrated that biological control of insect pests can be achieved if significant numbers of natural enemies are present at critical times during pest development. In farmscaping, beneficial organisms are considered – and managed - as “mini-livestock”. Livestock producers will tell you that their animals are healthier and reproduce more readily when provided an adequate and nutritious diet. Likewise, natural enemies require adequate supplies of nectar, pollen and plant-feeding insects and other arthropods as food to sustain and increase their populations. Flowering plants provide many of the food resources natural enemies need. 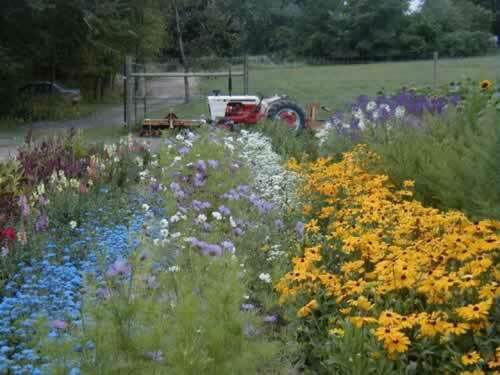 However, creating a farmscape of flowering plants picked at random may favor pest populations over beneficial organisms. This crude approach has been referred to as “Chocolate Box Ecology”. Planting a diversity of flowering plants to enhance biological control has been referred to as "chocolate box ecology" because of the colorful floral display. However, using this approach without knowledge of key pests and the interaction among plants, pests and natural enemies may lead to failure. Recent research has shown that the quality, not quantity, of the farmscape plantings is most important. Researchers now commonly screen plant species and use a range of selection criteria to determine appropriate botanical composition. An excellent reference on the topic is Ecological Engineering for Pest Management: Advances in Habitat Manipulation for Arthropods (2004). Gurr, Wratten & Altieri [eds], CABI Publishing). Reduced need for pesticides and savings in pest management costs. The pest suppressive influence of an effective farmscape will perpetuate as long as the farmscape provides suitable habitat for natural enemies. Increased habitat and wildlife diversity on the farm. A carefully planned farmscape increases overall ecological diversity and improves habitat for plant and animal species. Farmscaping is adaptable to any farm plan. Insectary plantings can be placed adjacent to crop fields, but they can also be placed next to paths or roadways, on steep banks, along drainage ditches, or in buffer zones. Erosion control/soil building. Farmscapes placed in contours between fields, steep ditches, or places that are easily eroded gives stability to the soil. Farmscaping can also be used as a filter strip to prevent water runoff and soil erosion. Plants used in farmscapes contribute to healthy soil by adding nutrients and organic matter. Keep in mind that farmscaping is not a “silver bullet” that alone will solve all pest problems. Rather, it is an ecological approach or tool that can be combined with other pest management strategies as part of an integrated organic pest management program. In this phased approach to on-farm pest management planning, farmscaping (2nd phase) is integrated with other pest management strategies. Priority is given to preventative pest management strategies like farmscaping, followed by more direct measures if preventative strategies are not sufficient. Reference: Zehnder et al. 2007. Annual Review of Entomology. 52: 57-80. There are many different approaches and strategies in farmscaping. Many farmers start with a simple farmscaping plan, such as including strips of a cover crop within a cash crop, based on the farmer’s observation that the flowering cover crop attracts beneficial insects. The farmer may later add other elements such as perennial hedge rows, perimeters or strip plantings of beneficial habitat seed mixes, and herbs and/or cut flowers known to support natural enemies of the farm’s major pests. One common approach in farmscape planning is to first think about the intended crop, then the key pest(s) that are known to attack the crop, then determine the commonly occurring natural enemies of the pest(s), and identify appropriate food plants and harborage requisites. The most successful farmscape systems have been developed and fine-tuned by farmers to fit their individual circumstances. What are its food and habitat needs? Where does the pest come from, how is it attracted to the crop? What factors influence pest abundance, and when/how does it cause economic damage? What are the most important endemic (local, naturally occurring) predators and parasites of the pest? Where do predators/parasites come from, how are they attracted to the crop and what factors cause them to persist in the crop? Are critical resources (pollen, nectar, alternative hosts/prey) available at the right time? Which annuals and perennials can compensate for critical gaps in resource availability, particularly when prey is scarce? Figure 3. Assassin bugs are generalist predators; although they feed on both pest and beneficial insects they are generally considered to be beneficial. 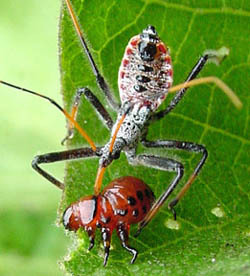 Photo credit: eOrganic photo archive http://eorganic.info/sites/eorganic.info/files/u30/Assassin_Bug.png. Augmentation of beneficial habitat. When establishing insectary plants, consider both perennial and annual options; i.e. permanent plantings such as hedgerows along with flowering annuals. Depending on key pests and beneficials present, it will probably be advantageous to establish year-round beneficial organism habitat and food sources. The “beneficial habitat season” may be extended by adding plants that bloom sequentially throughout the growing season or the whole year. 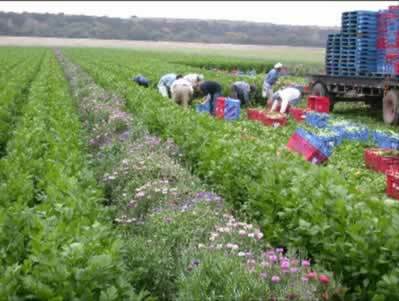 Trap Crops: Trap crops are more attractive to the pest than is the market crop. This is due to the timing of the appearance of the trap crop and/or because it is physiologically more attractive to the pest insect. What seed and plant sources are available? What is the cost in time and dollars involved with land preparation, planting and maintenance of annual and perennial plantings? What are the equipment and supply needs? Flowers or extra-floral nectaries provide nectar. Nectar is a source of liquid sugar (energy) and vitamins for beneficials, and is critical for optimum performance. Research has shown that for a typical parasitic wasp, egg laying capacity can be 10 times greater for females given a high quality nectar diet compared with females given a poor quality diet. Extra-Floral Nectaries are nectar glands that are not associated with flowers. Parasitic and predatory insects use extrafloral nectaries as food sources and mating sites. The supplemental nectar provided by extrafloral nectaries is important, especially during the early season or periods of drought when few plants are in bloom. Peonies, sweet potato, bachelor button and lima bean are examples of plants with extrafloral nectaries located on various parts of the plant. Flowers that provide pollen. Pollen is a source of protein and protein is critical for egg laying. 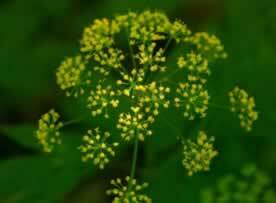 Many plants in the Umbelliferae family are good sources of pollen. Another good pollen producer is the corn plant. Alternative hosts for beneficial insect prey. In some situations it is useful to establish plantings that will support prey populations that can provide food for natural enemies to sustain their initial establishment into the area. For example goldenrod and fennel can be planted to harbor aphids that serve as hosts for early-season predator species. The flower structure providing pollen/nectar must be accessible. Some of the best nectar source plants are those in the wild carrot family (also known as Umbelliferae or Apiaceae), such as dill, fennel, tansy, Queen Anne’s lace, caraway, coriander, and parsnip. These plants have small, open flowers that are accessible to the tiny mouthparts of small, parasitic wasps. Fennel (both the common and bronze varieties) is not only attractive to small parasitic wasps but its flowers also attract syrphid flies, lacewings, mantids, lampyrids (lightning bugs) and ladybugs. Thus, this one plant can attract a “guild” or several different types of beneficial species. An easy way to add Umbeliferae to the farmscape is to buy carrots or parsnips at the market with the tops on and plant them in the farmscape. If planting as a market crop, let some plants go to seed and overwinter to provide an abundance of flowers next season. Figure 6. Wild parsnip (left) and Figure 7. 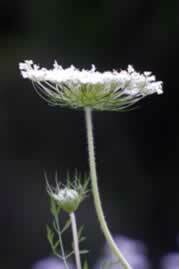 Queen Anne’s Lace; note the many small flowers accessible to the mouthparts of small parasitoid species. Photo courtesy Dan Tallman, Northern State Univ. Keep good records of where, when, and what pests occur on the farm. Gather information about key pest and natural enemy life cycles and habitat requirements. Make a list of available strategies to go into your farmscaping “toolbox” that can be implemented to create a friendlier habitat for the beneficials, and a more unfriendly habitat for pests. Select a combination of strategies from the toolbox that best fit your farm plan (i.e., location of your fields, crops grown and rotation plans, available equipment and labor). Choose appropriate annual and perennial insectary plants. Observe and keep records of the results; experiment with different strategies and fine tune the system. Start simple and small, then develop and expand the farmscape based on observations and results. Once the farmscape is in place, regular monitoring of plants will indicate whether a healthy population of beneficial insects has been established. 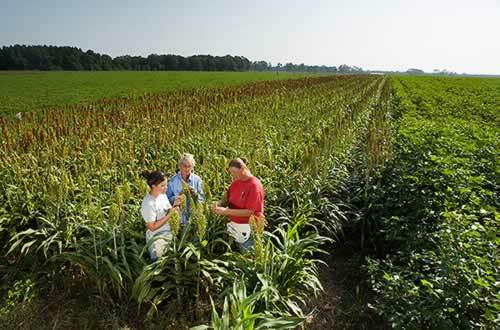 Sampling of crop plants should be done at least weekly. Insect sampling guidelines are available online. Use your web browser to search for “insect sampling guidelines” by specific crop. As a general indication of the effectiveness of farmscape plantings, 25-30% of crop plants that are sampled should show signs of beneficial insect activity (visible predators and parasitoids, cocoons, mummies, partially eaten egg masses, etc.) and/or they should be pest free. Consider the Area to be Farmscaped. The optimum area of the farm devoted to farmscaping depends upon the dispersion capabilities of the beneficials you want to attract (see Table 1 below). For example, syrphid fly adults can travel over long distances, so food plants established in just one location could support syrphids that could travel over the entire farm. 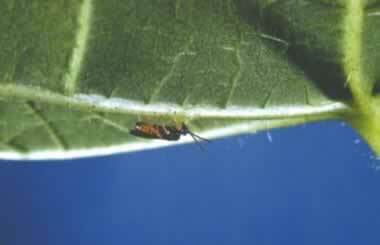 To attract small parasitic wasps or ladybugs with a much more limited range, it is necessary to establish food plants in several areas of close proximity to the crop. In general, multiple “clumps” of food plants spread out over an area will generally be more effective than establishing just one large “clump”. Table 1. Dispersion capabilities of some common beneficial insects. Added Value. Remember also that farmscaping plants can add value beyond biological control. For example, fennel and colored yarrow varieties can be sold as cut flowers. Flowering medicinal plants like echinacea, fever few, and boneset also have multiple uses. Weather. Weather variations from year to year may strongly influence whether a particular management practice is effective. Therefore, a flexible approach is needed to be able to adjust beneficial habitat according to weather conditions. Observation and experience are the most valuable tools in this regard. 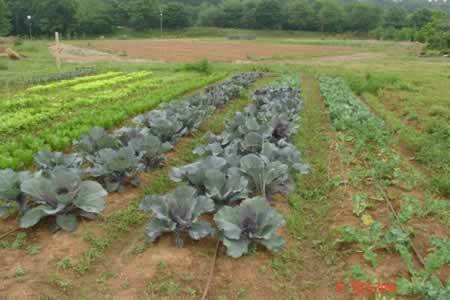 Intercropping is the practice of growing two or more crops (usually different families) in the same area. Strip cropping is a derivation of intercropping and is the practice of growing two or more crops in alternating strips across a field. Both practices serve to increase biodiversity and make the habitat less suitable for pest development. Pests find it easier to locate host plants when grown in a monoculture versus a mixed planting. This is based on the “Resource Concentration Hypothesis” which says that plant-feeding insects are more likely to find and stay in more dense and less diverse patches of their host plants. Interplantings of non-host crops may also act as a food source or habitat for beneficial organisms. More research is needed to understand the complex interactions among pests, natural enemies, and mixed crop habitats. This is a broad topic that refers to the addition of specific plants to enhance the growth and quality of nearby crops. In a pest management context companion plants are usually added to deter or repel pests. The African marigold, for example, releases thiopene—a nematode repellent—making it a good companion for a number of garden crops. A recent study on the effects of non-host companion plants on host finding by the cabbage root fly and onion fly demonstrated that companion plant odor had little or no effect, but that plant size, leaf area and color were the most important factors in disrupting host location. Figure 8. Example of companion planting (from left to right; lettuce, cabbage and sunflower). A trap crop is a crop that is planted to lure insect pests away from the cash crop. The trap crop can be a different plant species, a different variety, or just a different growth stage of the same species, as long as it is more attractive to the pests when they are present. Successful use of trap crops is challenging. The trap crop must be more attractive to the pest than the cash crop, and steps must be taken to ensure that the pests in the trap crop don’t later migrate to the cash crop. Trap crops are not effective against pests that are weak fliers and/or are wind-dispersed (e.g., aphids, spider mites). Trap crops were originally designed to be used in conventional systems where insecticides could be used to kill the pests in the trap crop. In organic systems approved insecticides can be used, but pests can also be eliminated by crop destruction. The timing is critical – destruction too early or too late can negate the trap crop effects or even result in mass pest migration to the cash crop. Figure 9. 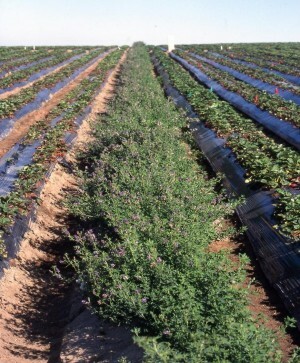 Alfalfa planted as a trap crop in strawberries to control tarnished plant bug. Photo credit: Sean Swezey (University of California) and the Organic Farming Research Foundation. Dufour, R. Farmscaping to enhance biological control: Pest management systems guide [Online]. NCAT. ATTRA-National Sustainable Agriculture Information Service. Available at: http://attra.org/attra-pub/farmscape.html#appendixe (verified 17 March, 2010). Gurr, M. S.D. Wratten & M.A.Altieri (eds.) 2004. Ecological engineering for pest management: Advances in Habitat Manipulation for Arthropods CABI Publishing, Ithaca, NY. Zehnder et al. 2007. Arthropod pest management in organic crops. Annual Review of Entomology. 52: 57-80.